Ever use something for a short while and then when you throw it away feel awful about it. I know that I feel that way every time I use aluminum foil. It just feel so wasteful. 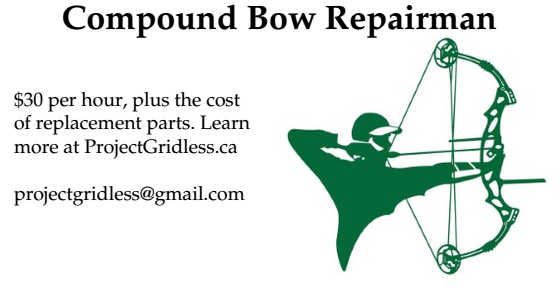 When you are living off the grid it is especially important to find ways to reuse the products we consume. Not just because it will help us save some money (especially in this bad economy), but also because it will help the environment. There are so many ways to recycle old products and here are a few suggestions on making your trash new again. 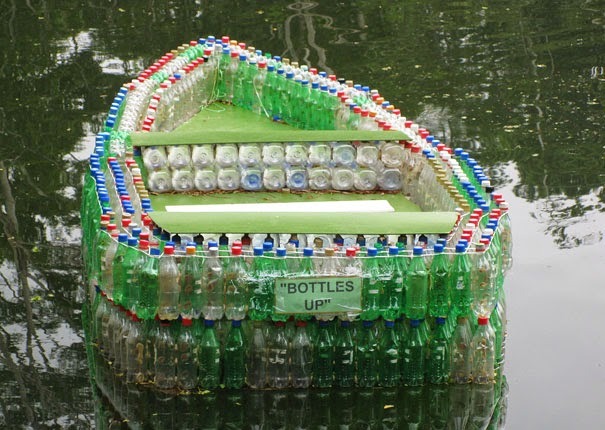 These may seem a little out there but making a boat out of plastic bottles could be a really useful project. Empty plastic bottles will float on water and so all you really have to do is attached them together and make sure that you boat is water tight. This boat may not be a great option for the open sea but could get you where you need to go on a quiet stream or river. The total cost would be negligible compared to a fiberglass or metal boat options and besides the benefit you are already getting by drinking the contents of the bottle you will feel good about using the bottle instead of just throwing them away. Yes, art is important. We all love to look at beautiful pictures and we would all appreciate having a beautiful sculpture in our house. The problem is we are not all billionaires that can afford to buy art whenever we want. I have found an alternative solution to getting access to art by dating an artist, but if you don't have access to free art like me, you could try to do it yourself. Old plastic caps may be the medium for you if you are not classically trained in foreshortening and do not have a solid understanding of how the human form should be drawn. The caps come is a wide range of colours and simply need to be arrange in an aesthetically pleasing manner. You can make them gradually change from red, orange, yellow, green, blue and purple or you can try to make a image of something you like (for instance a cat). 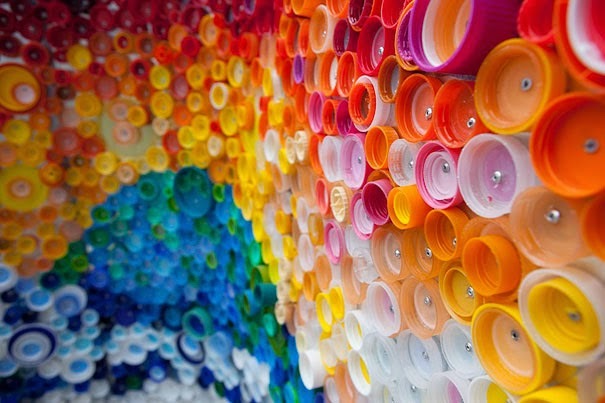 Either way you will be helping the environment by reusing the bottle caps and creating a focal point of conversation in your living room when guests come over. Those old plastic milk jugs can be quite handy if put to good use. 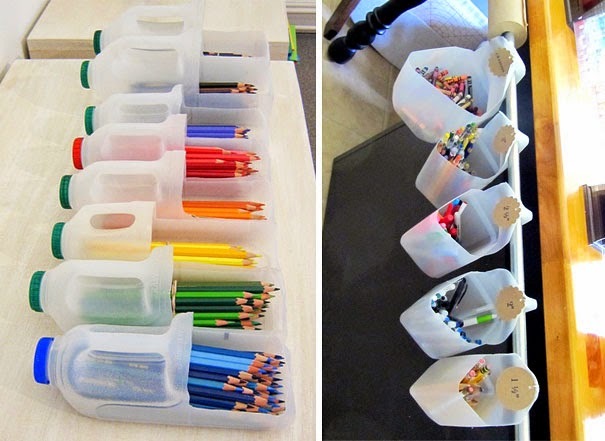 If you have kids and hate having to clean up after them, why not try to make you life a little easier by making a pencil and marker organizer. All you really need to do is cut out a section on the front of the jug (cut a square section that starts at the middle of the jug on the side opposite the handle, then cut up and around until you reach the spout, continue past the spout to make a similar cut on the opposite side). You can also cut a small section out of the bottom of the handle that will allow you to hang the jug over bar or some string. You can just throw in whatever you need to without causing too much of a fuss. This is particularly innovative. All you have to do take a water bottle, cut a hole in your ceiling small enough to fit the water bottle, fill the water bottle with water and place it in the hole. On sunny days the light will shine through the water bottle, diffuse in the water and light up the room like a light bulb. It is not the brightest light but is a cheap, environmentally friendly way to light up the room. Roses are always a great addition to a home and what is more renewable than plants that grow in your own garden. Roses come is a variety of colours including red, pink and white all of which could bring a beautiful quality to your home. If you wanted to keep those roses a bit longer you could think about coating them in roofing tar. Roofing tar roses only take a few minutes to create and all you have to do talk to your local roofing company - although honestly, this is such a bizarre idea you probably have better taste than to go through the process. The end result is a black crystalline rose, but you have to go through the sticky process of making it and drying it to create the final crystallized version. I hope these suggestion may make you think again before you throw something in the trash. When it comes to living off the grid reusing materials can make life much easier. DIY projects like the ones above can provide you with the freedom that attracted you to living off the grid in the first place.